Letters of appreciation and testimonials to Sweetwater Homes, Inc. 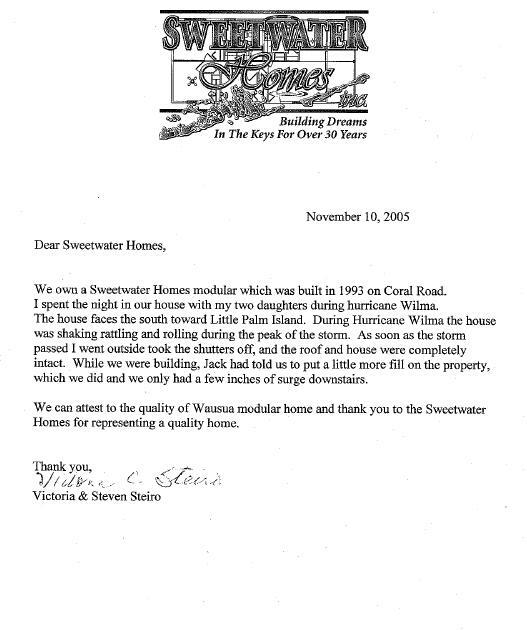 Letters of appreciation to Sweetwater Homes, Inc.
Over the years, we have received many letters from appreciative home owners about the homes we have built for them. We will include a few here. As you know, we took possession of the home you built for Jim and me in July 1996. In the process of planning our home you explained to us certain options which we did not know that were available and valuable in your opinion. Among these was the possibility of adding strength in the building that would exceed the code for hurricane strength. Although there was no attempt to "sell" us on this option, we decided to go to the 155 mph hurricane strength. We also decided to add two feet to the stilts. At all times, your office was considerate and professional in every way. As a lawyer, Jim appreciated the straightforward way you approached this construction. The proof of the pudding so the speak became obvious after the September 1998 hurricane Georges. My neighborhood received a horribleblow from Georges and most of my neighbors had extensive damage. Knowing that I had recently become widowed, I was especially grateful that Shane quickly checked the house for me. My total damage consisted of a few lost roof shingles over one corner of the deck roof and the loss of three or four lower stair 1" X 1" decorative timbers no doubt caused by the storm surge of more than two feet. Shane took care of the repairs at a minimal cost to me, far less than the deductible on my insurance. I was also pleased that the ground floor store room m which we kept outdoor furniture and yard supplies performed exactly as it was supposed to do under the code. Although quite a bit of water flowed into the store room, it also drained out and aside from some mess, no damage was done. As a recent widow, I did not need more problems so I am especially appreciative that the modular home you built performed better than I could ha ye imagined. I would unconditionally recornuiend your homes and your work to anyone anticipating building in the Keys..
More Thank You Notes and Recommendations.